The Nova scotia Duck retriever which is also known as Tolling Retriever was developed in Canada. This dog breed is the cross of retrievers and working spaniels, it was originated to lure duck in the clever manner of a fox. The Nova Scotia Duck retriever was the creation of competent Canadian hunters. 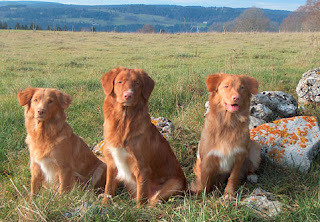 The breed was also called little river duck dog or yarmouth toller when the Canadian kennel club started to registering them in the late 1950s. this breed looks like a small golden retriever they are healthy and well maintained dogs and they have a deep chest which help them to swim in cold waters . this breed has a single coat and come in different colors it normally has small white dots on its feet, chest,tail tip. Some times on their face the coat is straight and some times it is curly. This dog breed is very tough and have a very good nature, they are friendly and intelligent. The nova scotia are a good learner and very obedience with their master, they also need a good trainer who can give them enough time, they are good with children and old people. They are very hard working dogs and enjoy to be with their master. The water-repellent double coat of the Nova Scotia Duck-Tolling Retriever should be combed and brushed with a firm bristle brush, paying particular attention to the dense undercoat. Dry shampoo regularly, but bathe only when necessary for it removes the natural oils in the skin which make it naturally water resistant. This breed is an average shedder. The Nova breed of dogs do well in apartments and even in small houses but they need regularly exercise to be attentive. This energetic dog needs a lot of physical exercise they need to be taken for regular walks or jog to make them happy and fit. This is a healthy working breed that is becoming more popular day by day. With its limited gene pool, a corresponding increase in some health dangers have occurred. Besides some thyroid and autoimmune problems, progressive retinal atrophy is starting to show up in the breed. Like all other breeds of dogs, it is your responsibility to keep an eye out for any symptoms of health problems your pet might be facing. If you notice any irregular changes in your dog be sure to consult a health care provider for your dog for an early diagnosis and treatment, any health problems if caught early can be treated in a timely manner keeping your pet comfortable and healthy. This breed of dogs generally lives for between 12 to 14 years.